This project is an example of the growing trend towards heavy weight toughened laminated glass solutions particularly in commercial environments. 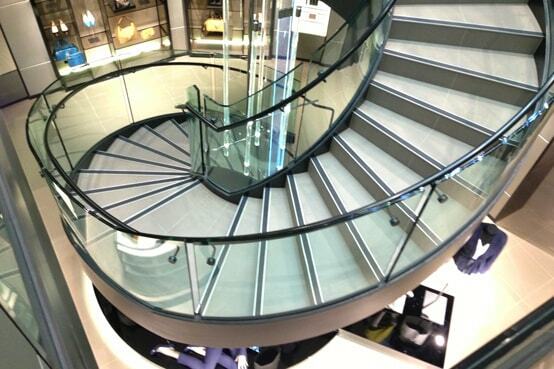 Hugo Boss’ German architects have created a stunning curved stair design as the centre piece of their new Sydney Store. Bent and Curved Glass Pty Ltd faced a challenging task to manufacture the highest quality frameless curved glass balustrade, including tight radius complex shape panels. The success of the glass installation required BCG to utilise not only technically sophisticated manufacturing methods but a high level of operator skill and experience in both the glass bending and laminating processes.